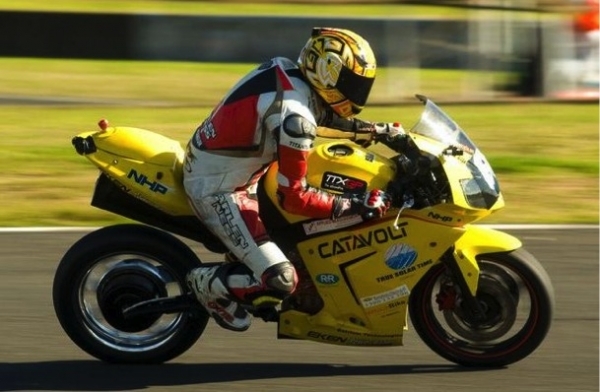 Australian Road & Track Rider Promotions (ARTRP) and TTXGP are excited to announce the continuance of their relationship into the 2012 racing year. With the success of the fledgling eFXC/TTXGP 2011 electric racing season, 2012 is looking really bright with last season’s entrants poised to bring their new technology to the race track and show just how much faster they have become. The inaugural series winners Team Catavolt are busily preparing for the 2012 season. Team owner Jon Eggenhuizen said "We have been developing our revolutionary hub motor in the off season to try and make it run cooler and therefore make more power, experimenting with both water and oil cooling options. We are also excited to be running with a different manufacturer's frame that will allow us so much more scope to run different battery and motor configurations, whilst having much more improved handling and suspension"
A number of interested bystanders watched last year’s start-up electric series with keen interest, contemplating starting their own assault on the 2012 eFXC/TTXGP Championship. Mark’s team has designed a machine around a Yamaha R6 frame and running gear with a locally sourced high torque DC motor.